It Can be a big leap from amateur to professional but here’s a new name in British luthiery to watch out for. David Reid’s creation has an unusual design, disarming panache and an eye for precision. Unless completely self-taught, most luthiers would probably opt to complete their training before taking the plunge into the world of full-time guitar making. Not so 29-year old Scotsman David Reid. He’s still studying for an HND in the subject at London’s Guildhall University, but he already has a dozen or so acoustics to his credit, some of which can be seen – and bought – at top West End acoustic store, Ivor Mairants. Not that the Guildhall is Reid’s guitar-building baptism. He made his first instrument in his spare time in 1998, then gave up his day job as a plasterer to study Mechitronical Engineering (robotics, pneumatics, computer aided modelling – that sort of thing). Despite a love and evident affinity for engineering – he scooped an award for academic achievement – guitars won out, and a move to Glasgow ensued, for the final year of a guitar-making HNC at Anniesland College, also involving repairs and restoration. His tutors recommended Guildhall (formerly the famous London College of furniture) as the next step, which brings us up to date. Along the way, Reid has set up a workshop where he build’s in the traditional manner, using very little machinery. Most of Reid’s instruments are of essentially conventional design and construction, but one that isn’t is this auditorium-size Vault Back. The pronounced curving to the back is unusual to see these days on guitars made from wood, but it was a common form of construction for renaissance-period lutes and on early guitars of the 16th and 17th centuries. 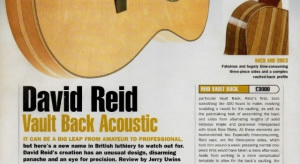 Aside from liking its aesthetic properties, Reid sites the shape’s ability to eliminate standing waves for a balanced, even projection across the spectrum – indeed, bowlback acoustics are founded on similar principles. Three grand may seem a mighty price tag for a newcomer’s instrument, but a major factor must be taken into account: time. This particular Vault Back, Reid’s first, took something like 400 hours to make, involving sculpting a mould for the vaulting, as well as the painstaking task of assembling the back and sides from alternating lengths of solid birdseye maple and pearwood interspersed with black fibre fillets. All these elements are bookmatched, too. Especially time-consuming, Reid says, are the three-piece sides, which took him around a week; preparing normal one piece rims would have taken a mere afternoon. Aside from working to a more complicated template to allow for the back’s vaulting, the rims’ constituent timber strips have to be laid up for gluing, and temporarily secured with veneer tape on the inner surfaces to prevent the risk of separation as they are carefully hand-bent to shape on a hot iron. In the final construction, vertical strips of Mahogany are used for reinforcement. You quickly begin to appreciate where else the money has gone, too. 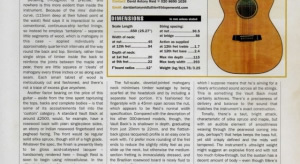 The high-grade bearclaw sitka spruce top employs a kind of double-X Bracing pattern. The finger board and bridge are Brazilian rosewood, the latter carrying shell-inlayed boxwood pins. The bindings – all done by hand – are figured maple and rosewood; likewise the soundhole rosette, which is inlaid with paua shell, which is also used for the position markers and side dots. The Spanish-style peghead is treated to a figured sycamore facing, with a veneer of Macassar ebony on the rear. Both have contrasting-colour wood underlays, giving a coachlined effect around the perimeter of the headstock. Detailing throughout is precise, and nowhere is more evident than inside the instrument. Because of the rims’ dish-like curve, (115mm deep at there fullest point at the waist) Reid says it is impractical to use conventional, continuous-strip kerfed linings, so instead he employs ‘tantalons’ – separate little segments of wood, which is mahogany in this case – applied individually at approximately quarter-inch intervals all the way round the back and top. Similarly, rather than single strips of timber inside the back to reinforce the joints between the maple and pear, there are little squares or ‘cleats’ of mahogany every three inches or so along each seam. Each small tablet of wood is meticulously cut and fashioned, and there’s not a trace of excess anywhere. Another factor bearing on the price of this guitar – aside from the time spent tap-tuning the tops, backs and complete bodies – is that some of its accoutrements fall into the ‘custom’ category. A standard Vault Back at around £2500, would, for example, have a rosewood back with plain single-piece sides, an ebony or Indian rosewood fingerboard and peghead facing. The front would be regular solid sitka spruce, though still of a high grade. Whatever the spec, the finish is presently likely to be gloss acid-catalysed lacquer – handsomely rendered here – though Reid is soon to begin using nitrocellulose. In the ultimate interest of tone and resonance, and for those customers not insistent on a mirror-like sheen, he prefers to use an oil finish, French polish is also offered. With an intrinsic beauty, courtesy of the vaulting and the multi-timbered back and sides, the instrument has a front on profiling which is generally handsome. The only minor jar to the eye is a little ‘flatting’ as the shoulders radius toward the neck joint – slightly more on the treble side than the bass. The curve could be smoother, then, and – for my tastes – a little less breadth across the top bouts might add an extra degree of elegance to the overall body shape. Still, that’s very subjective. One thing’s for sure: this is the lightest acoustic of its size I’ve ever played, tipping the scales only marginally over 1.75kg. Constructional refinement – the tantalons and cleats – is part of the reason, but Reid recons it’s mainly due to the pearwood, a very lightweight timber that apparently is also easy to work with. The full-scale, dovetail-jointed mahogany neck minimises timber wastage by being scarfed at the headstock and by including a separate heel portion. It’s fashioned for finger style with a 45mm span across the nut, which appears to be Reid’s normal width specification. Compared with the description of his other 000-derived models, though the Vault Back’s is shallower in depth, graduating from just 20mm to 22mm, and the flattish-back (gloss lacquered) profile is an easy one to work with. I’d prefer more rounding of the fret ends to reduce the slightly nibby feel as you slide up the neck, but other wise the medium section fretting is immaculately dressed, and the Brazilian rosewood board is nicely fluid to the touch. String spacing at the bridge is a main stream 55mm. David Reid says he has developed his quasi-double-X bracing to ‘separate more effectively’ the bass and treble ends of his instruments, which I suppose means that he’s aiming for a clearly articulated sound across all the strings. This is something the Vault Back most certainly achieves. There’s a preciseness of delivery and balance to the sound that matches the instrument’s exact construction. Tonally, there’s a taut, bright attack, characteristic of sitka spruce and maple, but with an audible element of smoothness weaving through (the pearwood coming into play, perhaps?) that helps keep the bass full, yet still defined and the mids well tempered. The instrument’s ultra-light weight might suggest an explosive front end with not too much follow-through, but the sustain has a decent amount of body – even though there’s a suggestion of hollowness that introduces a slightly insubstantial texture further on in the decay. Whatever, it’s a strong, responsive sound for an auditorium-derived acoustic, and the volume is subjectively as loud and well projecting as some dreadnoughts. Presumably the vaulted construction is partly to thank for that. For a man whose guitar-making tally is barely into double figures, the quality of David Reid’s Vault back is phenomenal. Taking into account the added build complexities, the result is, frankly amazing. To my eyes and ears, this could be the work of a master luthier. As I said I’m not quite sure he’s got the upper-bout profiling quite right aesthetically, but other wise this guitar is a tour de force. And the price? Well, three big ones is indeed a lot of ackers, but divide that by the time involved, and simple arithmetic will tell you it’s hardly caning the hourly rate – and that doesn’t even take into account of the cost of the high-quality materials or running a workshop. A prediction: David Antony Reid, to give him his full moniker, is going to be a much-lauded name among British Luthiers before too many more years are out.